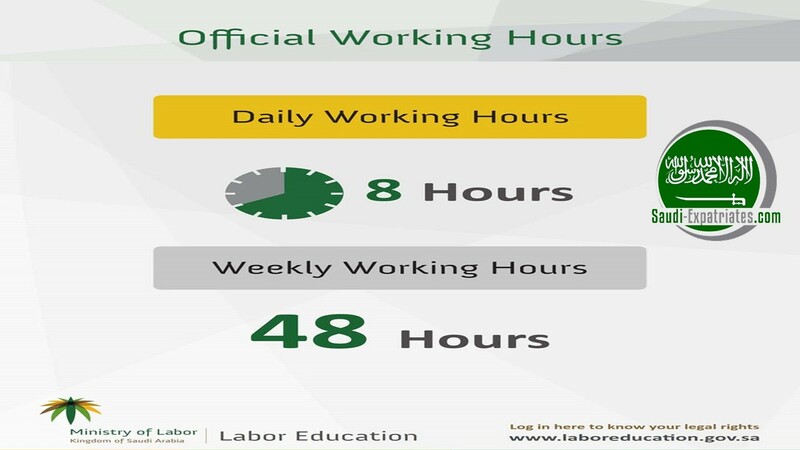 As per article (98) in Saudi Labor Law, An employee or worker in Saudi Arabia should not work more than 8 hours in a single day, If the employer decided to re adjust the working hours due to any reason then it should not exceed more than 48 hours in a week. Similarly in (Ramzan) Ramadan month working hours for Muslims should not exceed 6 hours in a single day or 36 hours in a week. Also read this article "Approved 38 amendments in Saudi Labor Law October 2015'. If you refer article(99) in Saudi Labor Law, It is mentioned that working hours can be raised to 9 hours in a single day for few workmen or employees in certain operations and industries, If the worker is not working continuously. Similarly working hours can be reduced to 7 hours for few workmen or employees in certain industries or operations of a harmful nature. The categories of employees or workmen in few operations or industries shall be determined by Minister's decision. As mentioned in Article (100) of Saudi Labor Law, Employer may seek Ministry's approval, If the work is in shift operations and the employer is increasing working hours more than 8 hours in a single day or 48 hours in a week on a condition that average working hours in 3 weeks should not be less than or more than 8 hours in a single day or 48 hours in a single week. Saudi Labor Law Article (101), Working hours shall be scheduled that no employee should work more than 5 consecutive hours without taking rest or break for prayer and meals. Break or rest period should not be less than half hour during the working hours. Similarly an employee cannot work more than 12 hours in a single day. Saudi Labor Law Article (102), Break or rest period should not be included in working hours, An employee should not be in employer's authority during break. It is not require to stay workman or employee at employer's workplace during break time or rest time. Read in Article (106) of Saudi Labor Law. The provisions of Articles (98)-(101) shall not apply to few cases: Read in Saudi Labor Law Article (108). For Overtime, Read this article "Overtime Labour Law in KSA", For Vacations and Leaves policy under Saudi Labor Law for Workers or Employees in Saudi Arabia, Read this article "Vacations and Leaves under Saudi Labor Law".